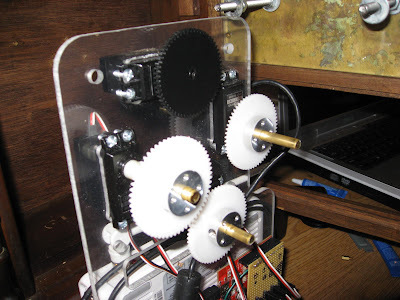 The gear train had to be big enough to fit four servos around the center axle without interfering with each other. It had to be small enough to fit inside the cabinet along with the router, arduino, and wires. It had to allow the four shafts to turn independently while constraining them from moving perpendicular to the face. It had to be something I could actually build in my limited workshop. 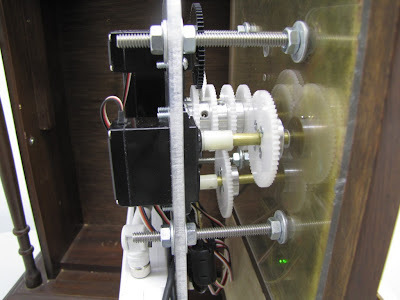 The four servos are each driving a shaft with a gear. The gears turn another gear in the central cluster. The central cluster drives the four concentric shafts that are connected to the hands. In this picture, your looking at the movement edge-on. The red line indicates the center shaft running through the middle of each hand. Two of the four servos are visible at the right top and bottom. The front and back planes are cut from plexiglass on the CNC machine. 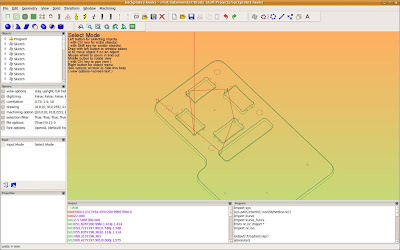 I used HeeksCAD and the companion project HeeksCNC to generate the gcode for cutting the parts. The drive shafts are made from K&S hobby brass. This stuff is easy to find at hardware and hobby stores. It's easy to work with, inexpensive, and comes in a wide variety of sizes. In fact each size exactly fits inside the next larger size. Exactly what I needed. They front and back planes are held together (and apart) by four carriage bolts. The front side of the front plane, which is next to the back side of the brass face is countersunk to let the carriage bolt heads recess. The back plane supports the servo motors. 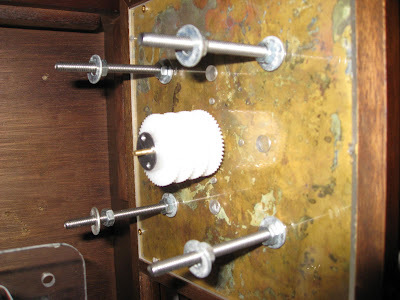 The gears and shafts are sandwiched between the planes and held in alignment. 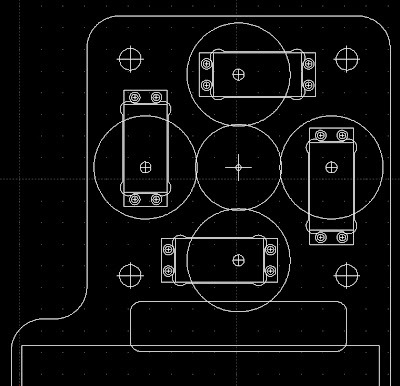 I ended up extending the back plane down to support the arduino and the router. This design worked out well because the entire movement is accessible when the door is open. When the front and back plane are assembled, they hold the gear cluster in place and keep everything aligned. 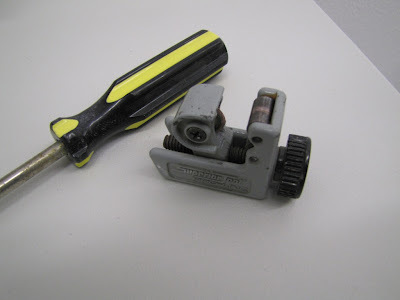 A small tubing cutter is indispensable for getting the shafts cut accurately. It does tend to roll the cut edge inward so a round file is needed to remove the lip before the shaft will fit together. Backplane: The large plexi piece that forms the back of the assembly. Servo: Provides the power to turn the hands. 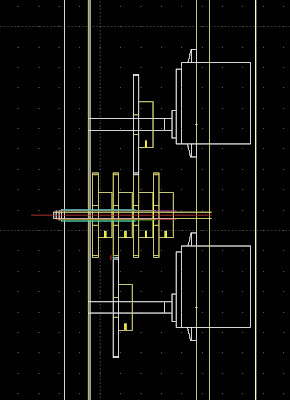 Is mounted on the backplane. Adapter: A little nylon fitting I found that allows a 1/4" tube to be connected to the servo. 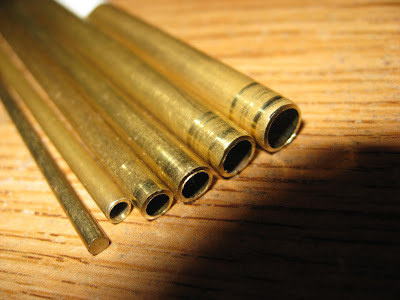 Shaft: A 1/4" piece of brass tubing. Hub: An aluminum part that slides on the shaft and has a set screw to tighten it in place. Gear: Nylon gear screws to the hub. Frontplane: The front end of shaft is set in a recess in the frontplane. This holds everything in alignment. The frontplane is then screwed to the cabinet directly behind the face.